Adam Tambellini netted a hat trick to lead the Surrey Eagles to a 6-3 win in Game 4 of their first round series with the Langley Rivermen on Tuesday evening at the Langley Events Centre. With the win, the Birds won the best-of-five series 3-1 and advance to the Mainland Division Final. Surrey started the game on the power play after Viktor Dombrovskiy was late getting off the ice at the end of warm-up, and the Birds capitalized when Brady Shaw cut hard to the goal off the left wing and beat James Barr just 35 seconds into the game. Langley equalized before the period was halfway through when Evan Campbell picked up his second goal of the post-season, shoveling the puck past Michael Santaguida after a shot from the right point by Turner Popoff. The Eagles retook the lead under two minutes later as Trevor Cameron found the back of the net, scoring on a rebound after Tambellini got a nice shot away from the left face-off circle. The Rivermen had to kill off an early Surrey power play to start the second, but after succeeding in keeping the Eagles off the scoreboard in the first two minutes of the period, Langley tied the game when Mitch McLain rippled the mesh for his first of the playoffs. The Surrey power play converted again later in the period to retake the lead as Tambellini scored his first of the evening, and Nic Pierog made it 4-2 shortly thereafter when his centring pass intended for Kevan Kilistoff bounced off Jivan Sidhu and into the Langley goal. Tambellini found the back of the net again in the late stages of the stanza with a hard wrist shot off the left wing, and the Eagles took a 5-2 lead to the dressing room after 40 minutes. Tambellini completed the hat-trick early in the final frame when he and Cameron were sprung in on a two-on-none, and the Edmonton native kept the puck, deking to the backhand before tucking the biscuit through Barr’s legs to make it 6-2. 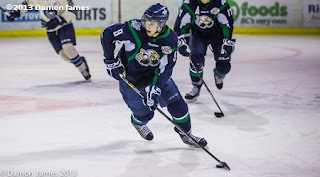 Trevor Cope responded for the Rivermen with a goal just eight seconds later, but Langley couldn’t stage a third period comeback, and the Birds sealed the victory in the game and the series. Langley Head Coach Bobby Henderson was thrown out of the game and given a Gross Misconduct midway through the second period after an outburst that saw him throw water bottles and milk crates onto the ice in frustration at the officiating. The Eagles had nine power plays in the game, scoring on two of them, while Langley went 0-for-2 with the man advantage. The Rivermen out shot the Eagles 34-31. With the victory, the Eagles advance to the Mainland Division Final where they will face either the Chilliwack Chiefs or the Prince George Spruce Kings. Game 1 will be played on Friday night (March 22nd) at the South Surrey Arena. For tickets, call 604-531-GOAL (4625) and help the Eagles defend the nest. Highlights courtesy of the Langley Events Centre.